Like a lot of artists, Michel Varisco is incredibly passionate. She’s passionate about education and her students at NOCCA; she’s passionate about her work, which combines photography and other media; and she’s passionate about the environment. Over the past few years, Michel has explored the intersection of land and water, a topic many of us are all too familiar with. 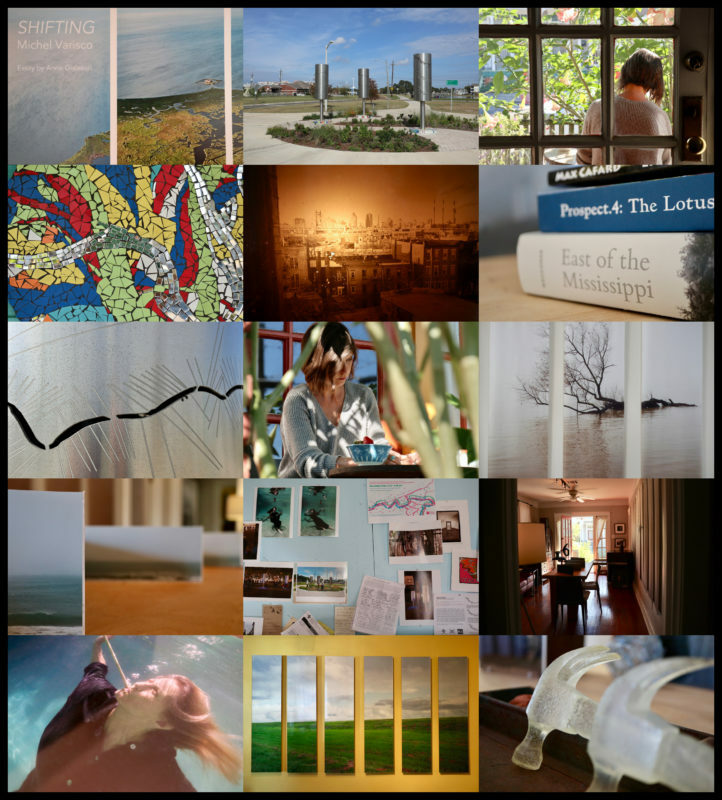 She captures the breadth, beauty and fragility of Louisiana’s wetlands. Her work is a stark reminder of what we stand to lose. Also like a lot of artists, Michel’s primary studio is her house. She works in her living room, guest bedroom, kitchen, backyard, and front porch. Images on paper, cloth, glass and metal, along with various “arrangements,” can be found throughout the house. There’s also a wall dedicated to ideas. It has Post-it-notes, spliced-together aerial photographs, newspaper clippings, and other tidbits of inspiration – for future works of art no doubt. Michel’s studio is not confined to her Bayou St. John home. When she’s not there (or at NOCCA), she can be found paddling in the swamps and marshes around New Orleans, wading into the surf off some barrier island, dipping into the murky waterers of Lake Pontchartrain, or flying in a plane above Louisiana’s disappearing coast. She goes wherever it takes to pursue her passions. Michel Varisco is represented by A Gallery for Fine Photography on Chartres Street in the French Quarter. Her upcoming show, “Below Sea Level,” opens on Saturday, December 9th. Her work for Prospect New Orleans is located on the Lafitte Greenway near Jefferson Davis Parkway. You can learn more about her and her work at http://www.michelvarisco.com.